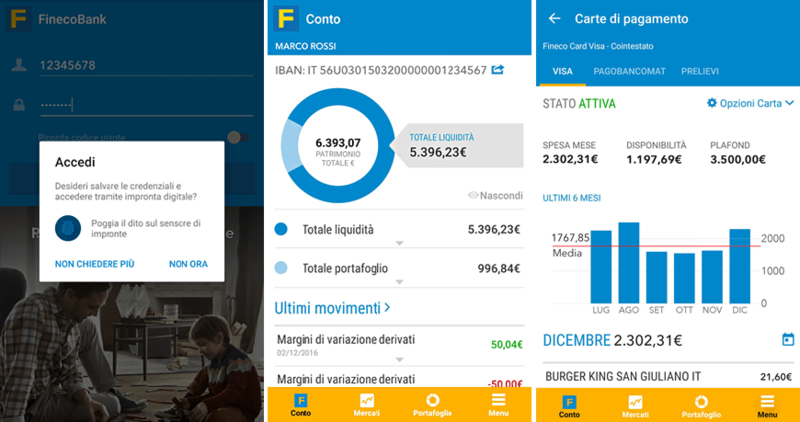 Better and smarter, it’s Fineco app. From account management to advanced and professional trading, from cardless withdrawal to instant loans, from mobile collaboration to real-time prices: everything directly from your smartphone. Download the Fineco app and make it your own app: there is nothing more personal than your savings. Faster and easier investing: receive notifications from your Personal Financial Advisor, consider their recommendations and confirm an order - whenever and wherever you like. Top-up your phone and reloadable card, set spending limits, increase or unlock card limits to make MaxiWithdrawals of up to €3,000 or MaxiPurchase of up to €5,000. Pay bills, make MAV and RAV payments, and make transfers and payments – including internationally. Immediately take advantage of movements in the markets, wherever you are: check your portfolio, get the latest updates from the world of finance and manage your orders quickly, efficiently and easily – even on the move. 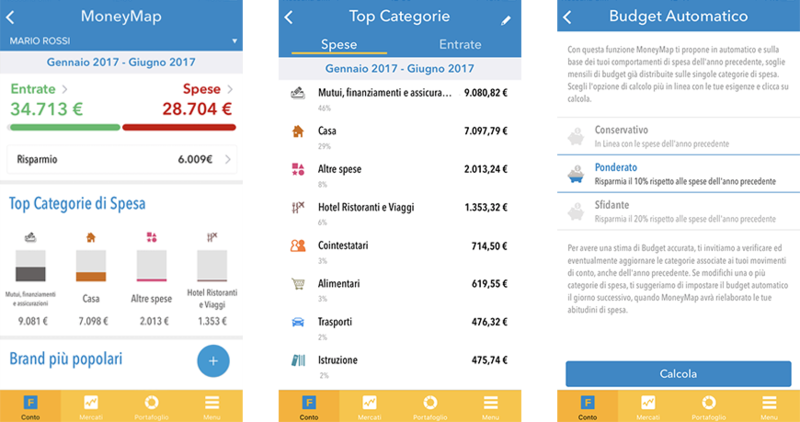 Thanks to the Fineco app, having an overview of income, spending, and savings - wherever you are and in total privacy - has never been so easy. Login to Fineco using your fingerprint and gain instant access to banking, cards, transactions and investments. 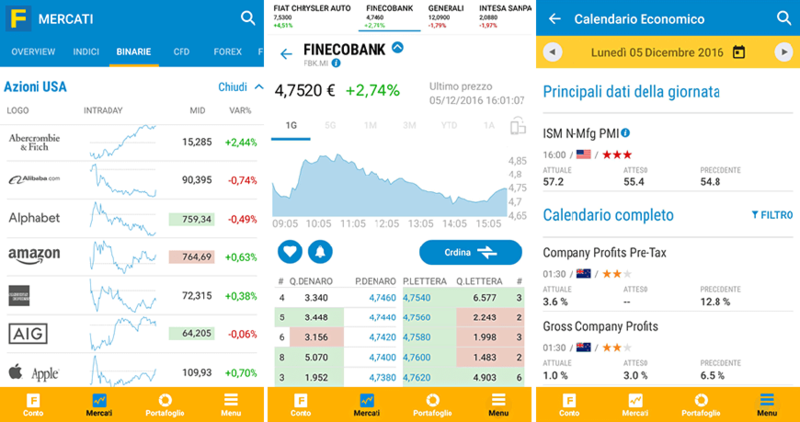 And if you want to invest or trade, the Fineco app is also a truly professional platform. View balance and transactions of euro and multi-currency accounts. Login to the app using your fingerprint. Choose which page you land on after logging in. Configure your privacy settings, allowing you to hide some information about your account. Manage your cards in real time, directly from your smartphone. Withdraw at UniCredit ATMs without any card. Just need your smartphone. Select the limits for your payment cards and increase your credit ceiling. Fast access to transfers, payments and international payments. Send and receive money in real time and make payments in seconds, even from app. Increase your card limits and withdraw up to €3,000 free of charge. Make purchases of up to €5,000 per day on the VISA Debit network. Share your IBAN instantly with whoever you want: it only takes a click. Wherever you are, find the nearest UniCredit ATM. Top-up your phone or reloadable payment card. Categorise income and spending and set a personalised budget to help you save money. Safe authentication with facial recognition. Just a simple photo to pay for your bills. Up to 15,000€ with instant assessment for pre-assessed customers. Indexes, news and leading markets at a glance. Greater customization, prioritizing your most recent and frequent operations. All markets in real time, with up-to-the-minute securities prices. With automatic push updates and a range of tools for you. Even more detailed, with news, similar securities and analysis. Issue "Stop Loss" and "Take Profit" instructions, direct from your smartphone. Economic and financial news, straight from the most prestigious channels. Real-time updates on the best and worst performing securities. An economic calendar, updated in real time. View all the gains and losses from your trading activities. No fees on share, index, currency and commodity CFDs. Select the type of graph, add indicators and track trendlines. Assess your PFA investment recommendations wherever you like. STARS and ADVICE complete report always available. Trade on the upside or downside of World Indicies, Currencies and Commodities.Discover more. Increasingly customized and easy to use, the Fineco app's advanced functions simplify your banking experience. All updated in real time, with maximum security and no extra costs. Login in with your fingerprint and authorize transactions using the same ID codes that you use for internet banking, with the same levels of security. 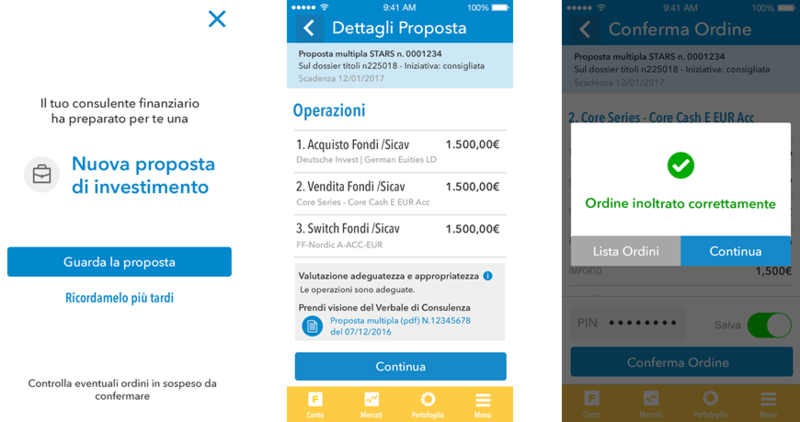 The app now offers all the banking and trading services available on the Fineco website. And all transactions cost the same as they do via internet banking. Now you can use your Fineco card to pay using Apple Pay or Google Pay™. All you need is your smartphone. It's that simple. Do you have an Apple device? Simply add your Fineco card to Apple Pay. Then you can pay contactless in store or in-app and online. Do you have an Android smartphone or watch? Just add your Fineco card to Google Pay and you can shop quickly, easily and securely. Discover all current promotions and choose the one that suits you. Setting up automatic orders does not guarantee their execution at the selected price, since hitting this price triggers submission of the order and not its execution. The price may change between the submission of the order and its execution, particularly in certain cases, such as "thin" or highly volatile stocks.